Last week, Adult Swim brought us the schwifty news that Rick And Morty will be part of our lives for a long time to come, renewing the show with a massive 70-episode order. 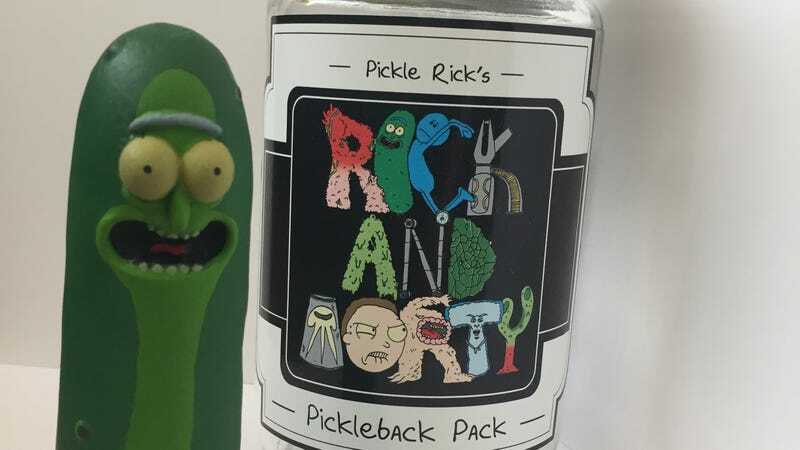 And to celebrate, we’re giving away a limited-edition, hand-crafted “Pickle Rick Pickleback Pack” to one of our readers in Chicago. Only 250 of these babies were made, and they’re promotional items that will never be available for retail sale, so we’re not kidding about the “limited edition” part. Our partners at Adult Swim have asked that we limit this giveaway to our hometown of Chicago, so if you live in the City of Big Shoulders and want to be the most elite Rick And Morty savant in town, email us with your name and shipping address (no P.O. boxes, please) at avcontests@theonion.com before 6: 15 p.m. CT tonight to enter. That’s right, you only have one hour before we close the contest and randomly choose a winner, so get on it, Chicago! UPDATE, 6:30 p.m.: ...Aaaand we’re closed. Thanks to everyone who entered, and congratulations to Eduardo in Chicago!